Yes! Is It possible to turn off the Aero in Windows 7 to 100% on Pro and Home, Version W7 starter has no Aero. This permanent disable the Aero example is also for Windows Vista, Windows 10 and 8.1 has no Aero! Please open the "Control Panel" over: "Start" » "Control Panel"
Please open in the "Control Panel":» "Administrative Tools"» » "Services"
In the "Services" - List select and open the "Desktop Window Manager Session Manager"
and Stop and Disable the "Service". Windows-7 - FAQ-17: How to turn off the Aero in Windows 7 to 100%, not disable it? To disable click sound on Windows 7 when clicking link eg navigation click Please open the "Hardware and Sound" to change the system sounds in Win-7. How to turn off aero in windows 7 starter? Turn off aero in win 7? Aero in windows 7, is it possible to turn it off? Disable aero windows 7 starter? How to fully disable aero? Aero turn off windows 7? How to turn off aero in windows 7? Turn aero on windows 7? Windows 7 turn aero off? How to disable aero windows 7? Service related to Windows Aero? Disable aero in window services? How to disable aero in windows 7? Disable windows aero server 7? Fully disable aero windows 7? How to disable aero on windows 7 starter? Windows 7 aero windows service? 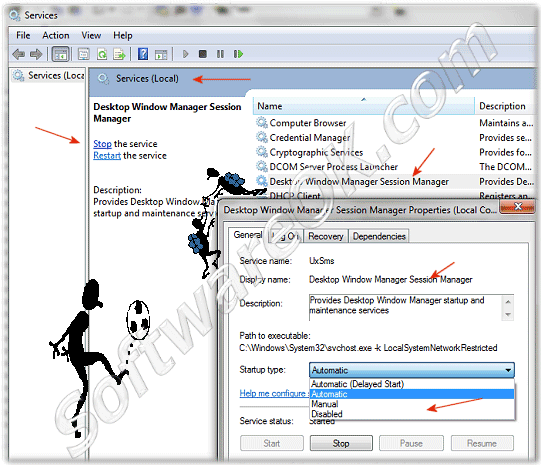 Disable Desktop Window Manager Session Manager Windows 7? Turn off aero windows 7 services? How to turn off aero Windows 7 Pro? Turn aero completely off 7? How to deactivate aero in windows 7? Turn off windows 7 aero? Disable aero for all users? Turn off aero win 7? Windows 7 fully off aero? Windows 7 dark aero off? Aero dropouts audio windows 7? How to turn off aero in win 7? How do i turn off aero in windows 7? Turn aero off in windows 7 pro? Disable aero windows 7 automatic login? How to disable windows aero win 7?